I've be en catching up on my blog reading this week (the infinitesimal downside to the holiday rush beginning is how behind I get on my book news! ), and I saw that the winners of the Roald Dahl Funny Book Prize, were announced! Louise Yates's picture book Dog Loves Books took the cake for the six and under crowd, while Louise Rennison's first of a new (!) series Withering Tights won for the seven to fourteen category. I am so pleased! I love both of these authors, and they certainly do know how to tickle the funny bone (and occasionally make you chuckle maniacally to yourself on the bus. Oh. Georgia Nichols on, how I wish you were real and had been my friend in middle school.) The only sadness is that Withering Tights won't be released in the US until June of next year. Cruel Britons, I say, calling our attention to books we can't even read yet. However, we can read some author interviews from the UK website Booktrust, and we'll just have to get by on that. 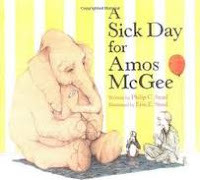 In other news items, the New York Times featured one of my all time favorite books of the year: Philip Stead's Sick Day for Amos McGee! 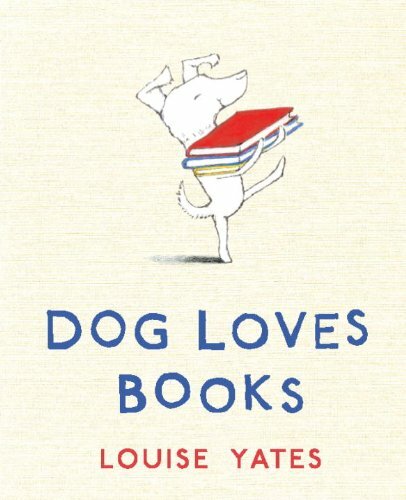 Reading Dogs and Untrained Boys is an article about a difficult-to-quantify aspect of children's books: humor. Not only is Sick Day absolutely gorgeous and my dark horse, long shot, sleeper choice for the Caldecott, NYT is right: it's funny. It's funny in the way kids books do best, by taking something we grown-ups think is preposterous, absurd, or downright silly, (like a zookeeper's animal friends taking care of him), as serious, as possible. I wish more books for "adults" could entertain "preposte rous" possibilities and not necessarily be space age science fiction. Then again, that's one of the reasons I read children's books - because adult books aren't enough for me. 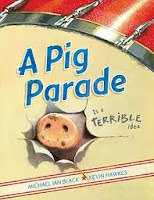 The article also reviewed Tad Hill's How Rocket Learned to Read (the author/illustrator of Duck & Goose board books), Peter Brown's Children Make Terrible Pets, and Michael Ian Black's A Pig Parade Is a Terrible Idea. This last title is unfortunately out of stock at the publisher currently, but we hope it will be back on the shelf very soon. 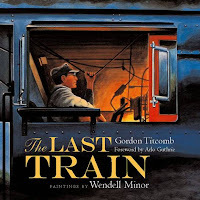 It was a busy weekend for Harvard Square: the square's centennial celebrations, the Harvard vs Yale game, and for our part of Folk Music Month, Gordon Titcomb and Wendell Minor signed copies of their new picture book, The Last Train. Both author and illustrator talked about their creative process: Minor about his intense research into the train engineer, conductor, and fireman's life, as well as his hunt for train memorabilia; Titcomb told us how their book editor wanted him to add more verses to his song to meet a picture book's 32 page length. Fans of Titcomb's music were also pleased to hear the original song, especially when a friend with a mandolin (I wish I had caught his name!) joined the group. It was a great experience for kids and adults alike - maybe even more so for the adult music fans! We even had a few celebrities drop by! Anita Silvey, whose latest book, Henry Knox: Bookseller, Soldier, Patriot, was illustrated by Minor, signed a few of her books and posed for photographs with Minor, Titcomb and fans. I also caught up with the fabulously well informed and friendly Nan Sorenson, the fabulous assistant executive director of New England Independent Booksellers Association. All in all, it was a very fun, celebrity-packed, musical day here at Curious George! During the holiday season we are halting author events and story time, but we will resume store events in January. Medals, wands, and ...holiday store hours! In more serious but still very exciting book news, the National Book Award Winners were announced. 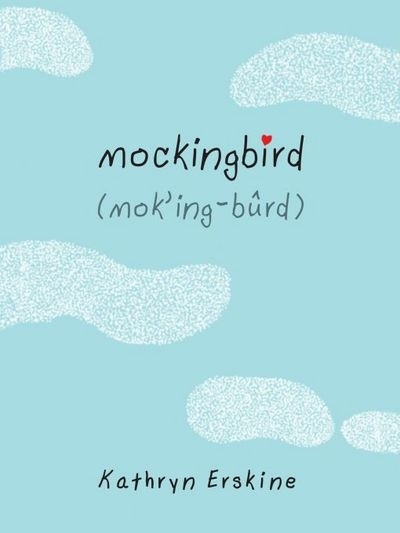 Mockingbird by Kathryn Erskine took the young adult category, with the finalists including: Ship Breaker by Paolo Bacigalupi, Dark Water by Laura McNeal, Lockdown by Walter Dean Myers, and One Crazy Summer by Rita Williams-Garcia. Lastly, it's almost time for our extended holiday hours - there will more hours in a day you can come in, shop around, and talk to your favorite booksellers! We will be closed Thanksgiving Day, and beginning on the 26th, the Friday after Thanksgiving, we'll be open Thursday through Saturday 10am to 8pm, with Sunday through Wednesday continuing at 10am to 7 pm. We hope to see you in soon! 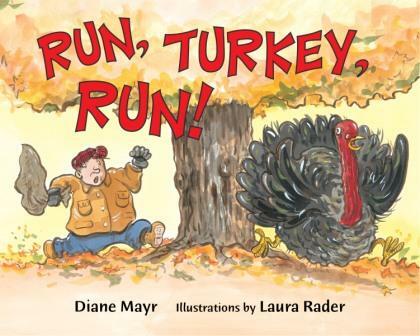 When it comes to holiday gatherings, it can be hard to choose the perfect holiday book to bring along - do you want to explain the origin of Thanksgiving, rejoice in the season change, or have a few chuckles with a frantic turkey? Here are a few of my favorites, from the serious to the silly. For the y ounger readers, ages 2 to 5, my favorite is One Little, Two Little, Three Little Pilgrims by B.G. Hennessy, illustrated by Lynne Cravath. The simple tale follows the familiar children's rhyme of "ten little Indians,"depicting both Wampanoag and Pilgrim children working hard throughout the year and celebrating their fruitful harvest. 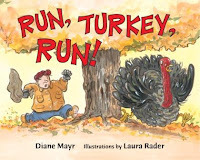 For presc hoolers with a sense of humor, I like Run, Turkey, Run by Diane Mayr, illustrated by Laura Rader. This quirky picture book encourages participation: "If Turkey swims in the water,/will the farmer think he's a duck?" kids can chorus, "NO! RUN, TURKEY, RUN!" I also like this book's vegetarian perspective, with the turkey eventually escaping his fate as dinner: "Turkey gives thanks!" Scholastic is a school standby, and their non-fiction series "Day in the life..." are surefire hits for elementary level kids. 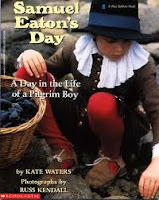 Try either Samuel Eaton's Day: A Day in the Life of a Pilgrim Boy by Kate Waters, or for a girl's perspective, Sarah Morton's Day, or the Wampanoag side, Tapenum's Day. Each book is full of detailed photographs of pilgrim/Wampanoag clothing, daily activities like sewing, hunting, or gathering mussels, and is written in the dialect of that era, with a glossary at the back. Waiting for Winter by German author/illustrator Sebastian Meschenmoser is one of the more gorgeous books about the changing of the seasons. Squirrel has heard of this mysterious winter phenomenon called "snow," and tries to stay awake through the cold season to see it. His friends hedgehog and bear are also intrigued, and they find various objects they take to be snow (a sock? tin cans? ), until the first magical snow storm sets them straight. Meschenmoser blends humor and beauty here to make a perfectly sweet snow story. 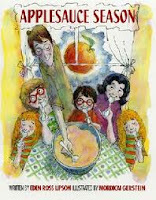 Considerin g that my favorite part of this time of year is how often my folks visit, one of my favorite fall books is Applesauce Season, by Eden Ross Lipson with illustrations from prolific Mordicai Gerstein. This book always makes me crave boisterous family parties and pie. As the apple season progresses, this family makes a variety of applesauces, apple crepes, and in memory of Grandpa's birthday, apple pie with ice cream. Mmmm. 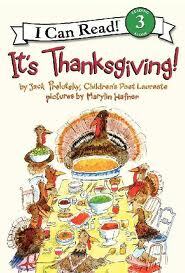 In the chapter book room, Children's Poet Laureate Jack Prelutsky reigns supreme with humorous Thanksgiving poems in the early reader It's Thanksgiving! My favorite poem might be "I Ate Too Much" (a common problem at our dessert loving house), with the lines: "I ate too much pudding and pie, I'm stuffed up with muffins/and much too much stuffin',/ I'm probably going to die." Pardon That Turkey by Susan Sloate is a non-fiction early reader that explains how Sarah Hale petitioned for years to make Thanksgiving a holiday, as well as the legend of Lincoln's presidential pardon of a turkey. I always find it impressive when beginning reader non-fiction can convey enough facts within the set vocabulary, and this title from the All Aboard Reading series is certainly successful there. Right about the time we moved into our most recent apartment, my husband and I put all of our stuffed animals into a box in our upstairs closet. Not out of some misplaced sense of what it means to be a grown-up, and not because we thought we were too old. We just had soooo many of them--teddy bears, dogs in Santa hats, Matt's extensive penguin collection. They took up a lot of space in our tiny apartment, and so into the closet they went, waiting to be doled out to our nieces over a series of visits. 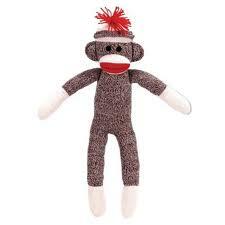 That being said, I would make space in my life for one of these classic sock monkeys from Schylling. They're slightly larger than the ones I've seen before, and something about their size and that squishy rag-sock aesthetic just begs to be snuggled. I'm also a sucker for the 'do. There's something adorably punk about the mess of red yarn hair hanging out on top of this plush primate's head, and I think any grown up with a sense of humor and a longing for the good old days of snuggling up with your favorite stuffed animal will get a kick out of this funky monkey. 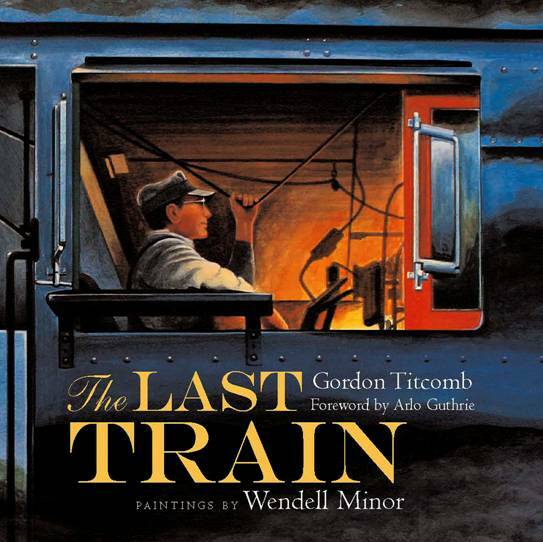 The Last Train Signing w/Gordon Titcomb and Wendell Minor! In case you haven't marked your calendars yet, here's a quick reminder of an upcoming event we're really excited about at the George. Gordon Titcomb, an amazing folk musician who has performed for 25 years with some of the world's most renowned artists will be here to read and sign his new book, The Last Train. The words in the book were once a song, and that rhythm carries through this beautiful book. A great rhyme scheme will engage young readers and listeners to chug along with the family that you meet as this story unfolds. Each spread has incredibly rich paintings from Wendell Minor, whose paintings have graced some of the most beloved children's books in recent times from Charlotte Zolotow's The Seashore Book, the cover of Julie of the Wolves, and Anita Silvey's new picture book set here in Boston Henry Knox: Bookseller, Soldier, Patriot. Mr. Minor will be here to sign as well. So join us for a musical, locomotive-inspired read-aloud and meet two legends to boot. This book, signed by both author and illustrator, would make a great holiday gift for the train enthusiast in your life, or anyone who can appreciate beautiful illustrations and the heirloom theme and feel of this engaging, satisfying book. So join us Saturday, 20 November at noon, and wear your conductor hat! Great news for picture book aficionados (and just in time for my mock Caldecott book club meeting! 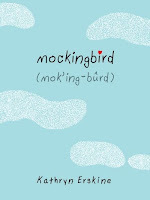 ), the 2010 New York Times Best Illustrated Children's Books have been announced! Follow the link to a slide-show of the chosen titles. This list differs from the Caldecott since they take into consideration books by authors from around the world. We're happy they included one of our staff favorites, Blexbolex's Seasons, although I wish they had also chosen The Quiet Book by Deborah Underwood. If only The Quiet Book's illustrator Renata Liwska lived in the U.S.! We've had these amazing puzzles in before--one for every continent--but now there's one puzzle for the whole world. Each piece is shaped like a country of the world, to fit together into a map of the World. Learn geography while having a blast! The World GeoPuzzle has 68 pcs and is 26.0" x 12.5"
Or, "I mean business!" in binary. Research shows that playing Mozart to your baby may not necessarily make your baby smarter, but what about giving your baby a Mozart? This cuddly, adorable composer will definitely inspire your child to be a prodigy like the doll's model. However--as the doll has no will of its own--it will most assuredly NOT accrue crushing debt as Mozart himself did. This week, the kid blog world got even friendlier! Our dear friend Katie, a former blogger, events coordinator and all round amazing lady, has made her own blog debut through the Horn Book: Out of the Box. This blog will feature various H'Book celebrities reviewing miscellaneous books and goodies that come through their offices, especially those that may not make it into the magazine or guide. Katie is a talented writer and reviewer, and while we miss her in the hut, we're certainly glad that even more folks can read her! You can also pick up the latest issue of the Horn Book here - not only is there a feature on Moomins ("MOOMINS!!!" Natasha shouted), but Katie also debuted on the masthead. This day in history...King Tut Day! I learned a fun fact this morning (thank you, Emerson radio, broadcasting joy and knowledge across the bay state!) - today is King Tut Day! On November 4th, 1922, archaeologist Howard Carter uncovered the entrance to boy king Tutankhamen's tomb. I ca n't get enough of activity books, and this particular oversize maze book is right up my alley. Mummy Mazes: A Monumental Book by Elizabeth Carpenter is a poster book of mazes, puzzles and codes. 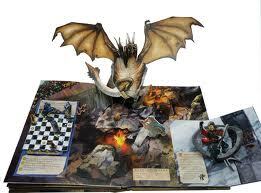 Each spread folds out to a giant maze or picture of famous Egyptian monuments, mummies, and pharaoh masks. For the f uture archaeologist, GeoCentral gives us a Pyramid Dig Kit, a pocket-size pyramid with digging tools and brush to unearth an ancient Egyptian treasure. The possibilities include a pharaoh head, Egyptian cat, Egyptian queen, and other relics. When it comes to books, if your history or mythology buff hasn't read a Rick Riordan novel yet, he has started a new series based on Egyptian gods called The Kane Chronicles. 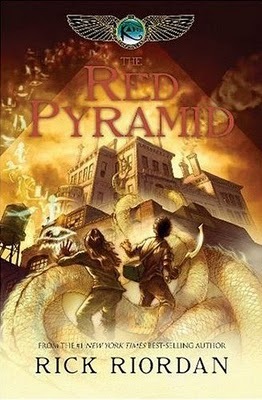 So far, only the first book, The Red Pyramid, is out, but once you start a Riordan series, you'll be chomping at the bit for the next installment. Brother and sister Carter and Sadie Kane have been raised separately since their mother's mysterious death six years ago. They are reunited under dire circumstances: their father disappears and accidentally releases violent Egyptian gods from captivity. 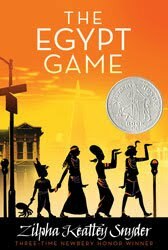 The Ne wbery Honor winner Egypt Game by Zilpha Keatley Snyder is up with The Westing Game for one of my all-time favorite mysteries. Four kids in California are fascinated by ancient Egypt and build an elaborate pretend world in an abandoned city lot. They research pharaoh history and create rituals, until mysterious murders occur in their neighborhood and they receive cryptic messages from their "oracle." 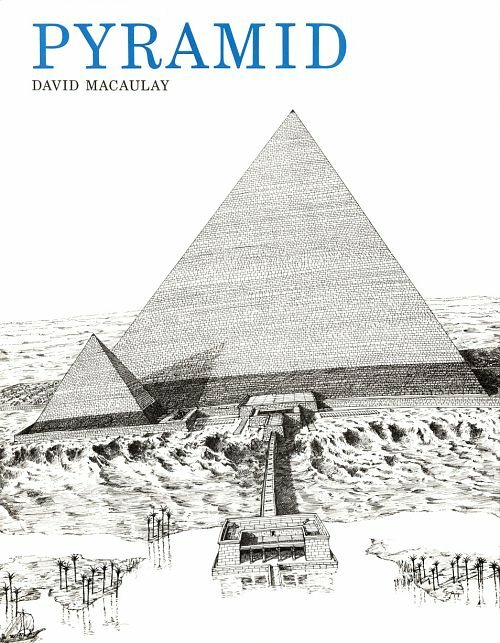 For non-fiction, our receiver John recommends David Macaulay's architecture book Pyramid. 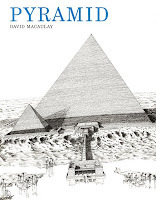 Macauley is famous for his detailed drawings, cross-sections, and clear explanations of both the architectural design and historical-social function of the buildings. In this case, how and why pyramids were built. Kid at Heart: Game Night edition! It's getting cold out there folks. Sweaters and scarves have officially made their way out of closets, light fall coats traded in for heavy jackets. I've even seen some gloves and hats starting to come out--worth noting on my weather hardened New England peers. So it should surprise no one that lately I've been noticing a lot more of my pals opting for a quiet night in, watching movies or playing games, rather than going out, walking around, and exploring the city. So in the spirit of staying in and keeping cozy, allow me to shed a light on some of the nifty board games we've got downstairs in our chapter book room right now. We've got loads of grown up friendly classics sure to entertain, like Monopoly, Risk, and my personal favorite, Scrabble. But if you're pulling an all out game night with your pals, why not indulge in some of the sillier games of childhood while you're at it? 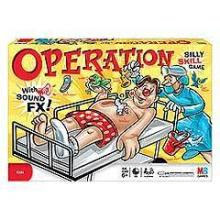 I can't think of a single soul who hasn't enjoyed the nervous thrill of Operation (and the inevitable jolts and giggle fits that go along with that buzz of failure when you slip up mid-removal. The new version has nifty new sound effects too!). And if you prefer your game night a little more a ctive, we've got Twister, a sure bet to get you and your friends up on your feet (and then possibly right back down again on the floor!) And if you're rushing home in the cold and don't want to be bogged down with a lot of big bags, we've got bunches of Bananagrams ready for picking. 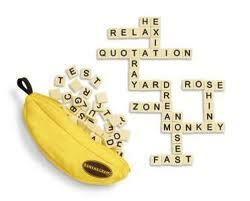 They pack all of the linguistic fun of scrabble, but in a convenient size that fits in a purse or a satchel, and with a silly banana inspired package. So go ahead, pop some popcorn, slip into some thick fuzzy socks, and hunker down with your buds for some indoor fun.